The New Testament Canon is not a doctrine? Or if not, what of the development of the trinity? That "development" happened through years and years of councils, debates and imperial nitpicking before anything definitive was reached. There wasn't just an "infallible proclamation", "Rome has spoken, the case is closed" thing, it was a very long process. Jesus Wars: How Four Patriarchs, Three Queens, and Two Emperors Decided What Christians Would Believe for the Next 1,500 Years is all about these subjects. Not sure I want to get my finger prints on this thread, but let me give you my two cents, or maybe about 10% thereof. But as a historian, how could you account for what Philip is saying? It is just a nice gesture? I don't have anything against those questions, but first I'd like to understand what you said already, in the OP. Do you see infallibility (either of popes in general or of St. Peter specifically) being discussed in the Phillip quote? If so, where? Regardless of "how" it came about. There is a development to this doctrine of the Canon, such that beliefs change for certain people. Certain people, such as those who follow St Athanasius will have to accept that the Shepherd is not "inspired", and some other will have to accept that Hebrews is "inspired". So if the Orthodox are going to allow for a "development of doctrine", such that many have their beliefs change (or more sharpened), why not accept Papal infallibility/supremacy just because it is a new concept? That's the thing though, Orthodox don't accept the development of doctrine idea. Orthodoxy is and was Orthodoxy, at the time the Holy Spirit revealed it to the Apostles. Any innovation to the deposit of faith afterward is only in relation to how it's expressed or understood, not what it actually is in essence. By the same logic, why not accept Sola Scriptura just because it's a new concept? The Trinity does not develop. He is. What kind of theology they teaching you wherever? As I pointed out (and yes, we have just been over this), since Philip said it in Latin it was a nice gesture unintelligible to the Fathers of the Ecumenical Council, who conducted the business of the Council in Greek. We also went over how the Letter of Pope St. Celestine doesn't match the rhetoric of Philip the Presbyter. Actually, Arianism was "spotted" as heresy. The papal claims of Leo/Damasus/ Gregory were not "spotted" as heresy. This difference is historically noteworthy. You are making this far more mysterious than it is. New Rome is now playing the same role that Old Rome did when Constantinople was on the rise, and for the same reason-a new Rome, namely the Third (Moscow), is now outshining it, as the new capital of New Rome outshone Old Rome (at the time sinking to the level of a clump of huts huddled around the ruins of its former glory. Constantinople, especially after it contracted to the Phanar, has been making a lot of excessive claims about itself, and, with the same deference that younger generations pay to their granny matron when she gets a little senile and at times bossy and even overbearing, remembering the lady of their younger years in her prime. Now the Phanar has of late really been straddling the line between misstatement and heresy, but it has not forced us-yet-to call it on its Ultramarism. If the loudmouth of Ultamarism doesn't tone it down, though, that day may come sooner than later. If one compares the rhetoric of today with Constantinople and Moscow, and compare it with Rome and Constantinople of the first millenium, there isn't any difference. God grant that it does not end the same way. Pope Celestine's letter only shows that all bishops alike have been entrusted with the commonality of preaching the truth. That's totally compatible with Catholic theology. Of course it is. What is not compatible with is the Vatican's theology expressed in Pastor Aeternus. You are also just skipping over the problem of the disconnect between the Pope's letter and the theology you are trying to get out of Philip the presbyter's speech, which isn't supported by the letter. not the least in that the letter makes no appeal to St. Peter's authority but it does appeal to St. Paul's, St. John's etc. authority. Was Phillip infallible. You say "seed" that is essentially what I found wrong with the roman church, development of doctrine. How can we avoid seeing this implicated from the text? I do believe that the EOC recognizes Rome with an honor of primacy or leadership for its important role in early Christendom and its connection to Peter. If and when the Church is reunited I understand that honor will be restored. However the jump you make from point 3 to 4 is enormous to say the least. Primacy does not equal supremacy IMO. As a matter of ecclesiastical unity Rome should be the focus, but that doesn't give the Pope untethered authority over the whole Church. The papacy doesn't constitute a fourth order. Based on early language of the Church the pope to me sounds like a sort of president of a council of equals, not the overlord overlord of peasants. As to infallibility, St. Peter himself was not even infallible. Christ even called him Satan! 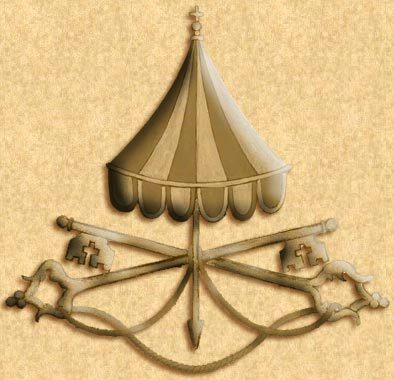 As part of the magestrium I understand that the Church is protect from false doctrine but how that translates to papal infalliblity is beyond me. But even Pope Honorius I was anathematized by the Third Council of Constantinople. We don't need the doctrine of infallibility to discern good doctrine from bad. It is self evident by the fruits. Just as the thought of fire does not warm the body, so faith without love does not actualize the light of spiritual knowledge in the soul. Just as the light of the sun attracts a healthy eye, so through love knowledge of God naturally draws to itself the pure intellect. That's a question that intrigues me - if the Orthodox and Catholics were to be reconciled on this side of the eschaton, would Rome reclaim first place in precedence? I think it's obvious Rome would want that, but from the Eastern side, Rome has been heterodox for (at least) a millennium. and yet I have become occupied in shameful things! I always thought it especially apt that Our Lord not only tells St Peter "Get thee behind Me, Satan", but does this no less than 4 verses after bestowing the keys and the power of binding and loosing. Indeed, it seems that for every Biblical verse that shows St Peter as the leader of the Apostles, there is also a verse demonstrating that he was far and away from being infallible. Well that would be the precedent, however the papacy would look much differently than it does today. Question I have is would the EP go for that? Honestly, though, aside from the theology most I don't think would mind having Francis as primus inter pares. In any case the Catholic church has come a long way since The dark ages. Infallible? An Inquiry is a book I am reading that deals with that very topic. And the gist of the answers I've heard as to this question are more or less like this: Rome, since it abandoned the Orthodox, would normally need to start from square one, if they decided to come back into communion. However, certain exceptions could be made that could ensure that Rome is still an important see in Christendom. Anyone can correct me if my evaluation is wrong anywhere. I'm asking you. You claimed it is, and I want to know what your source or reasoning for that is. That's a question that intrigues me - if the and Catholics were to be reconciled on this side of the eschaton, would Rome reclaim first place in precedence? I think it's obvious Rome would want that, but from the Eastern side, Rome has been heterodox for (at least) a millennium. I was reading about it and I came across the "Declaration of Ravenna" which essentially was agreed by the EP that the Bishop of Rome is still Primus Inter Pares, now, based on what I know about Orthodox governance that would have to be accepted by the Orthodox Church at large, which would probably be unlikely. The depressing thing about the schism is that for a Catholic Bishop, even the Bishop of Rome to attain such a high office would have to necessarily be quite certain that he is within the correct tradition, and equally so with Orthodox Bishops. So, to put it delicately, the schism will never be healed by an act of either Church "repenting". A Bishop would be far more likely to simply covert rather than attempt to effect change from the inside. Even attempting to do so, would likely cause an additional schism. The only way to reattain unity would be to meet somewhere in the middle, which, unfortunately, parties on both sides think compromises the faith. Though I have held out a lot of hope that the current Pontiff could gain unity, as a learn more about the situation, I grow less optimistic. Where I live there is a Catholic and Orthodox parish, each sitting across the street from each other, and each bearing the same name. How sad it is that a parishoner could commit apostasy simply by walking across the street to have communion with others just slightly different in theology and worship. And what hope is there for Protestant reconciliation? If Catholics and Orthodox are like Apples and Oranges, Protestants are like shoes. But that is exactly how Catholics understand the development of doctrine. They believe that there is one deposit of revelation in Christ to the apostles, and from this point forward there is no addition to it, only a further and deeper understanding of the one revelation. And they would say that Papal Supremacy/infallibility was not explicit in the beginning, but that it was there is "seed" form, and it took historical progression for events to call forth the actual explication of the doctrine. I meant the development of the Church's awareness and explication of the doctrine of the Trinity, not the Trinity himself. It is completely compatible with Vatican I. In fact, historic and modern Catholicism believes that every single Christian has the same command to preach and teach the gospel. It is a commission to every disciple of Christ. This does not deny primacy, nor supremacy, nor does it deny infallibility. No Catholics would every deny that each bishop is given an equal charge to proclaim Christ. To see such a thing as contradicting to Papal claims is simply to make a category error. Infallibility can be seen from the Philip quote if one exegetes the statement in the following manner. 6) Philip claims that Peter continues to be "active" in the Church through his successors, both now and "forever". I did finally find your "ergo" in that stack. Aristotle spins in his grave. And this, children, is why symbolic logic classes should be taught in school. I said Infallibility "can" be seen, not "must" be seen. Perhaps you should take a class yourself. And at the end of the day, your response is a hand wave, and really doesn't even interact with the data. Only after reading it into the text a millennium after the fact. There is a good point to your comment. However, we have instances in the very early Church where this is clearly taught by the early bishops of Rome. While Firmilian and Cyprian did not believe the Pope to be infallible, they were aware that Pope Stephen was claiming a jurisdiction authority when it came to the belief that heretics do not require re-baptism. Firmilian says that Stephen claims to hold the succession of Peter, upon whom the foundations of the Church were laid. What's the point of claiming that, except that Stephen was claiming to be "head" of other churches?? Similar instances are seen in Damasus, Leo, Julius, etc,etc. Sure. And each time they were rebutted by the catholic Church. If Stephen was really the head of the other churches, Cyprian would have accepted that claim, he didn't. Since the Apostolic deposit (as Irenaeus and Vincent of Lerins point out) is a single deposit. Since Cyprian took his orthodoxy from the same deposit that Stephen did, one of them would have to be innovating or detracting from that deposit to make new claims such as the one Stephen made against Cyprian. In other words, if Papal supremacy was part of the Apostolic deposit (as Rome claims) we would see overwhelmingly that Cyprian and others wouldn't have any problem with Rome's assertions. But they did. No worries, I took it in college. If you would like me address it, I will. First, you have far too many postulates. Second, you have a conclusion in the middle of the theorem. Conclusions always go at the end. Third, your conclusion cannot be derived from the stated postulates. Fourth, you affirmed the consequent which is a logical fallacy. Now, to look at it from a different perspective. Here is your argument. P1. Peter was the foundation of the Catholic Church. Let us first examine the first argument. It cannot be argued that because the set is infallible that a subset cannot be fallible. Indeed, if this were the case, then every person in the Church could claim infallibility. Second, Philip never introduces infallibility into the discussion, so we cannot, from Philip, derive that he even believes in the infallibility of the Church. Therefore we have an invalid postulate and a logical fallacy. Now, to examine the second argument which falls first on the fact that C1 was not proved. Second, we cannot demonstrate that fallibility cannot come from infallibility and considering the fact that humanity came from God, it is evident that falliblity can come from infallibility. We also have an additional problem that it cannot be demonstrated that the Bishop of Rome is the sole descendant of Peter, indeed, it could be argued that anyone who was ordained or followed Peter would have an equal claim to infallibility. Those are my initial thoughts on the logical problems surrounding your theory. Here is where I am upset. Where does Peter somehow equate with Rome? Antioch has just as much a claim to succession of Peter as Rome, and for that matter, I've never understood why Jerusalem is not considered the center of the Church since it was the center of the faith. Moreover, I think the Orthodox stance is not that the pillar is not "Peter" per se, but simply that Rome is not de facto "Peter". It was when Roman Bishops had the faith of Peter, but when they abdicated that faith in order to assume authority both temporal and spiritual, they ceased to carry on that faith. In that case, it is not the geographical location that Peter once governed that constitutes his see, it is the see the exemplifies his faith. As Christ appointed Simon as the Rock of the Church, this was not just his personage, it was also his faith and his revelation that was first conferred to Rome, and is now conferred to New Rome, as the Orthodox view it. With all due respect, of course. 1. The Church is infallible. 3. Because the Church said so. 5. The Church is infallible. As I see it, the faith is preserved not because we believe in the faith, or because of a dogma ratified by a council, but because we believe God loves us enough that He would not allow the faith to so deviate that future generations would be unable to find salvation. If every Patriarch of the EOC declared some heresy to be fact, they would simply cease to be Patriarchs. The faith would then prevail through some other means. And here is a conundrum... what if the Pope declared ex cathedra that he was not infallible? Of course the thinking is that it would be impossible for the Pope to declare that, as God would simply not allow it. But, I will tell you, ex cathedra is somewhat arbitrary. I learn doctrine not just by words but by actions as well. As I see faithful people act a certain way it teaches me about the faith. Yet, no Catholic believes the Pope is impeccable, yet his actions speak volumes about his faith notwithstanding. Gosh, Tris, that was fun. 1 over infinity is the same as 1,000,000,000,000,000,000,000 over infinity. The dogma of the Trinity does not evolve: to think it did is to say that those of this generation know more about God than the Apostles who beheld Him face to face, utter nonsense. 1) Philip says that Peter continues to AND EVER "lives" and "judges" (preside) in his successors, of which, at the time, was in Celestine of Rome. There seems to be an implication that this Petrine activity is ongoing. 2) The whole Church is infallible. Would you agree? 3) If Peter is the foundation of the Church, how could the foundation be subject to heresy or apostacy ? 4) You presume that the "set" (Church) can be "infallible" while a "subset" (Peter) is fallible. But that's the issue, Peter is not just a "subset" but is the source of the episcopate, as Cyprian says, the very foundation of the whole Catholic Church. The Pillar is not a subset of the whole. If the pillar is cracked and separated, the set is finished. I've observed statements like this make some people (I think he was an adjunct) very angry. (1) Except that you assume that the Bishop of Rome is the only legitimate successor to Peter's magic infallible powers. Where do you get that from? You presume that the "set" (Church) can be "infallible" while a "subset" (Peter) is fallible. But that's the issue, Peter is not just a "subset" but is the source of the episcopate, as Cyprian says, the very foundation of the whole Catholic Church. The Pillar is not a subset of the whole. If the pillar is cracked and separated, the set is finished. What about when the pillar dies? Let's be clear. "I" do not "assume". In fact, I am seriously inquiring Orthodoxy. However, as a Catholic, I must be untangled with the very argumentation which brought me to see the truth in Roman Catholicism. Secondly, it is not so much "I" assume, but rather the Fathers who, on both East and West, understood that there was a universal principle of petrinias in the whole episcopate everywhere, but also understood there to be a very special sense in which the bishops of Rome, on account of being heir to all of Peter's ministry (St Leo), are successors of Peter. Then infallibility will be continued via promulgating past dogmas and doctrines which the whole Church, under the past Popes, have given infalible assent to. Until the next bishop is put into the office of pillar. But the edifice has already been toppled. I agree wholeheartedly, but the conflation is yours, not mine. Again, I haven't seen anything that would determine that apart from the obvious; Rome was the capital of the empire. That's why it was special. "Pre-eminence" "special" "specific" "particular" "unique" etc. as far as I know, are not synonyms for the words "infallible" or "supreme", until you can find a dictionary definition that says otherwise, your words are meaningless. No it is yours. I never claimed that an ecclesiastical office always need to be filled in order for it to be a living principle always living in the Church. You assumed that I assumed this, and this is why you created a straw man. And so none of the Councils or statements of the Fathers matter to you? They matter to me greatly, which is why I don't buy the claims of Rome. Granted, I haven't read all of the pre-Nicene Fathers but the ones I have read don't say anything about infallible powers of a specific man residing in Rome. Not really. If Peter is the "very foundation of the whole Catholic Church", and without the foundation the Church is "finished" (your words); and if you would have us believe that "Peter" lives on exclusively in the Bishops of Rome, then you have to account for dead Popes and how it is that the Church (and its episcopate) continues to exist even if its foundation no longer holds up the edifice. While you never claimed that an ecclesiastical office always needs to be filled, yet by elevating the office as you have, you have made it essential to the existence of the Church as Church. So again, you have to account for sede vacante. Otherwise or additionally, define "a living principle always living in the Church".